We all wanted to go visit a chocolate factory when we were children but when we grew up, our priorities change. 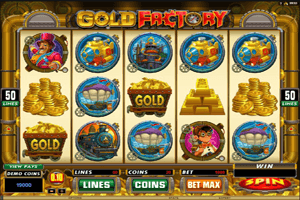 This is why Microgaming is inviting its players to take a rewarding trip into the Gold Factory where everything is made of gold so they can grab their share of the fortunes of the Gold Factory. Players will enjoy a top notch slot gaming experience that is presented to them in amazing graphics that are accompanied by equally outstanding sound effects. The game is dominated by the golden color, which is very fitting to the theme of the game. This is why players will also see plenty of golden icons spinning on the reels including the gold train, a gold mining cart, golden bars, the owner of the gold factory, golden coins and more. These symbols spin on the game’s 50 lines and five golden reels. The Golden Bonus coin is the special icon of the game, three of these coins will trigger the Gold Factory Bonus game in which players can earn up to 619,000 coins in rewards. The logo of the Gold Factory is the wild icon that will replace all non bonus symbols on the reels of the game to help players get paid.